Off late, there have been instances reported, of acts of violence against medical professionals. It’s understandable, with medicine not being an exact science, and human nature being emotional, especially in case of medical emergencies, sometimes leads to heated situations where patients, their families and people in general, vent their wrath on poor doctors and other medical personnel, who are actually trying to help their patient and them. However publicity of practice by a few of exploiting the patient, triggers a mass misconception that all doctors and medical personnel are the same. This misconception along with the emotional turmoil is the generally the trigger behind violence against medical personnel. Numerous strikes over the decades spurred the state legislatures to fill in the gap that was lacking in protection of the medical personnel, and in many states laws were promulgated which had special provisions for protection of medical personnel and simply not just doctors alone. In the nation’s capital, New Delhi, the principal law governing safety of medical personnel is the Delhi Medicare Service Personnel and Medicare Service Institutions (Prevention of Violence and Damage to Property) Act, 2008. While there exists general provisions of the criminal law, which focus on issues of violence against a person, this act is designed specifically to prohibit violence against Medicare service personnel and damage to property in Medicare services institution in the NCT of Delhi. As the name suggests the act prohibits any act of violence against service personnel as well as damage to any property. A person who commits such act shall be liable to a punishment with imprisonment for a term which may extend to three years, or with a fine which may extend to ten thousand rupees or with both. In addition, as maybe determined by the court, the offender shall be liable to a penalty of twice the amount of purchase price of medical equipment damaged and loss to the property. Not only this, the offences under the purview of the act are cognizable and non-bailable. 2) WHO IS THIS ACT APPLICABLE TO: The definitions of the act lays down its broad purview. It defines “ Medicare service institution” broadly to cover all the medical service institutions providing OPD, and IPD services as well as diagnostics, whether they are under the control of the Delhi Government, the Central Government, or the local bodies( including MCD, NDMC, etc), autonomous bodies as well as private hospitals, nursing homes, clinics as well as diagnostic centers. The Medicare personnel are under the purview of the act. 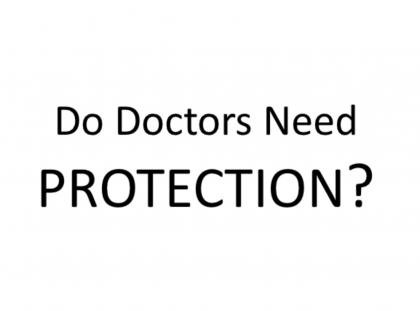 The broad ambit of the definitions is meant to include licensed medical practitioners, registered nurses, nursing aids, midwives, paramedical workers, diagnostic services provider, even ambulance service providers as well as cover any personnel working in the Medicare premises whether for the purpose of training, studies, etc. 3) HAVE EFFECTIVE COMMUNICATION CHANNELS WITHIN THE INSTITUTION: In case of an offence, only the head of the Medicare institution or his authorized representative has the authority to file a complaint, to the concerned authority under the purview of this act. It’s important, that the appropriate authority through a Power of Attorney or a resolution is drafted so that an authorized representatives are available readily within a medical institution to file a complaint. In addition a channel of communication need to be established between the head of the medicare institution and the other medical personnel for appropriate actions in case of a mishap. 4) LET YOUR NEARBY POLICE STATION KNOW ABOUT THE ACT: The Act gives the power to the court of a Metropolitan Magistrate to take cognizance of and try the offence under the Act. Moreover, for the court to take cognizance, there has to be a report in writing of a police officer, not below the rank of a sub-inspector. Appropriate communication should be initiated between the medical institution and the police station, making them aware of the provisions of this Act, prior to any incident, to procure cooperation and avoid delays. 5) SPREAD AWARENESS: Recently, hospitals in Maharashtra have put posters in their premises, of their state act designed for doctors’ protection. The posters play an important role informing all concerned parties about the existence and the purview of this act. Its advisable that similar poster are put up in medical institutions in Delhi too, so that ignorance of the statute cannot be claimed as a mitigating circumstance before the authorities. Besides the negative cascading effect, the positive of displaying such information spurs confidence in the medical personnel. 6) DON’T OVERINDULGE: The act is designed to provide safety for medical professionals, to provide them an avenue of justice in case of an offence. And as defined, it should be utilized for the purpose of justice and not other any other reasons .